When people ask me whether the progress of science is more compatible with theism or atheism, I offer the follow four basic pieces of scientific evidence that are more compatible with theism than atheism. Ever heard any of these responses? Below I list some resources to help you to respond to the four responses of atheists to the experimental data. 1) The Big Crunch/Bounce has been disproved theoretically and experimentally. Petrosian1 has recently discussed the possibility that the restoration of symmetry at grand unification in a closed contracting Robertson–Walker universe could slow down and halt the contraction, causing the universe to bounce. He then went on to discuss the possibility that our universe has undergone a series of such bounces. We disagree with this analysis. One of us (M.S.) has already shown2 that if a contracting universe is dominated by radiation, then a bounce is impossible. We will show here two further results: (1) entropy considerations imply that the quantity S (defined in ref. 1 and below), which must decrease by ~1075 to allow the present Universe to bounce, can in fact decrease by no more than a factor of ~2; (2) if the true vacuum state has zero energy density, then a universe which is contracting in its low temperature phase can never complete a phase transition soon enough to cause a bounce. The universe is not only expanding, but that expansion appears to be speeding up. And as if that discovery alone weren’t strange enough, it implies that most of the energy in the cosmos is contained in empty space — a concept that Albert Einstein considered but discarded as his “biggest blunder.” The new findings have been recognized as 1998’s top scientific breakthrough by Science magazine. […]The flood of findings about the universe’s expansion rate is the result of about 10 years of study, said Saul Perlmutter, team leader of the Supernova Cosmology Project at Lawrence Berkeley National Laboratory. Perlmutter and others found such a yardstick in a particular kind of exploding star known as a Type 1A supernova. Over the course of several years, the astronomers developed a model to predict how bright such a supernova would appear at any given distance. Astronomers recorded dozens of Type 1A supernovae and anxiously matched them up with redshifts to find out how much the universe’s expansion was slowing down. To their surprise, the redshift readings indicated that the expansion rate for distant supernovae was lower than the expansion rate for closer supernovae, Perlmutter said. On the largest scale imaginable, the universe’s galaxies appear to be flying away from each other faster and faster as time goes on. There has only been one creation of the universe, and the universe will never reverse its expansion, so that it could oscillate eternally. That view is popular, perhaps in part because many people watched videos of Carl Sagan speculating about it in public school classrooms, but all it was was idle naturalistic speculation, (Sagan was a naturalist, and held out hope that science would vindicate naturalism), and has been contradicted by good experimental science. You should be familiar with the 3 evidences for the Big Bang (redshift, light element abundances (helium/hydrogen) and the cosmic microwave background radiation. There are others, (radioactive element abundances, second law of thermodynamics, stellar lifecycle), but those are the big three. Point out how the experimental evidence for the Big Bang has piled up, making the problem even worse for the eternal-universe naturalists. Leave no doubt. 2) The multiverse has not been tested experimentally, it’s pure speculation. Multiverse thinking or the belief in the existence of parallel universes is more philosophy or science fiction than science. ”Cosmology must seem odd to scientists in other fields”. George Ellis, a well-known mathematician and cosmologist, who for instance has written a book with Stephen Hawking, is sceptical of the idea that our universe is just another universe among many others. According to professor Ellis, there is no evidence of multiverses, they cannot be tested and they are not science. Ellis is not the only multiverse sceptic in this universe. A few months ago, science writer John Horgan wrote a column in Scientific American, expressing his doubt in multiverses. When you get into a debate, you must never ever let the other side get away with asserting something they have no evidence for. Call them on it – point out that they have no evidence, and then hammer them with evidence for your point. Pile up cases of fine-tuning on top of each other and continuously point out that they have no experimental evidence for their speculations. Point out that more evidence we get, the more cases of fine-tuning we find, and the tougher the problem gets for naturalists. Leave no doubt. 3) Naturalistic theories for the origin of life have two problems: can’t make the amino acids in an oxydized atmosphere and can’t make protein and DNA sequences by chance in the time available. […]These results suggest that outgassing of Earth’s interior later than ~200?Myr into the history of Solar System formation would not have resulted in a reducing atmosphere. J Mol Biol. 2004 Aug 27;341(5):1295-315. Estimating the prevalence of protein sequences adopting functional enzyme folds. Proteins employ a wide variety of folds to perform their biological functions. How are these folds first acquired? An important step toward answering this is to obtain an estimate of the overall prevalence of sequences adopting functional folds. […]Starting with a weakly functional sequence carrying this signature, clusters of ten side-chains within the fold are replaced randomly, within the boundaries of the signature, and tested for function. The prevalence of low-level function in four such experiments indicates that roughly one in 10(64) signature-consistent sequences forms a working domain. Combined with the estimated prevalence of plausible hydropathic patterns (for any fold) and of relevant folds for particular functions, this implies the overall prevalence of sequences performing a specific function by any domain-sized fold may be as low as 1 in 10(77), adding to the body of evidence that functional folds require highly extraordinary sequences. So atheists are in double jeopardy here. They don’t have a way to build the Scrabble letters needed for life, and they don’t have a way to form the Scrabble letters into words and sentences. Point out that the more research we do, the tougher the problem gets to solve for naturalists, and the more it looks like an effect of intelligence. Write out the calculations for them. Leave no doubt. 4) The best candidate to explain the sudden origin of the Cambrian era fossils was the Ediacaran fauna, but those are now recognized as not being precursors to the Cambrian fossils. Evidence of the single-celled ancestors of animals, dating from the interval in Earth’s history just before multicellular animals appeared, has been discovered in 570 million-year-old rocks from South China by researchers from the University of Bristol, the Swedish Museum of Natural History, the Paul Scherrer Institut and the Chinese Academy of Geological Sciences. […]This X-ray microscopy revealed that the fossils had features that multicellular embryos do not, and this led the researchers to the conclusion that the fossils were neither animals nor embryos but rather the reproductive spore bodies of single-celled ancestors of animals. The trend is that there is no evolutionary explanation for the body plans that emerged in the Cambrian era. If you want to make the claim that “evolution did it”, then you have to produce the data today. Not speculations about the future. The data we have today says no to naturalism. The only way to affirm naturalistic explanations for the evidence we have is by faith. We need to minimize our leaps of faith, though, and go with the simplest and most reasonable explanation – an intelligence is the best explanation responsible for rapid generation of biological information. I do think it’s important for Christians to focus more on scientific apologetics and to focus their academic careers in scientific fields. So often I look at Christian blogs, and I see way too much G. K. Chesterton, Francis Chan and other untestable, ineffective jibber-jabber. We need to bring thehard science, and stop making excuses about not being able to understand it because it’s too hard. It’s not too hard. Everyone can understand “Who Made God?” by Edgar Andrews – start with that! Then get Lee Strobel’s “The Case for a Creator“. That’s more than enough for the average Christian on science apologetics. We all have to do our best to learn what works. You don’t want to be anti-science like atheists are. I recommend readingUncommon Descent and Evolution News every day for a start. I get what the whole positive thinking message is trying to do. Do better –Try harder – Be positive. I spent much of my life pushing that theme. I have come to realize that trying to spiritually exercise my way to salvation will leave me feeling beat up, frustrated and depressed, because no matter how hard I try I don’t measure up. There seems to be a popular theme in much of the modern-day church – a get better, self-improvement message replacing the gospel. Ministers pontificate from their crystal soap boxes with a positive self-help theme that has nothing to do with the message of the gospel. They preach; “You can do it” – Grace says, “I did it for you”. The message of the gospel is that of God’s goodness and mercy embodied in grace. Jesus in His mercy died on a cross that we might receive salvation. All the self-help in the world cannot earn even one ounce of grace. Concretized in the foundation of grace is a message that not only improves our daily life but leads the lost to forgiveness of their sins by the blood of Jesus Christ. All the help we need is found at the foot of the cross. Any advice on how to make your life spiritually better that is not channeled by the message of grace affronts the gospel and insults the life laid by Christ on Calvary. The message of gospel speaks to our heart’s deepest needs filling us with God’s purpose and desire. Many times as believers we think we need to grow deeper into God while thinking that the gospel is only for the unsaved. Sometimes we see the gospel as not feeding us with “solid food,” but only with “milk,” thinking that we need to move on fuller maturity of knowledge. In truth, there is more than enough meat found in the message of grace that keeps us grounded in our infancy and in our maturity as Christians. Grace reminds us that everything we need for our past, present and future is found in the gospel. I have come to realize and understand that I must remind myself every day of the work of grace in my life, less I become insensitive to the message of the gospel that decrees the mercy of God. It is when I forget the message of grace incarnate in the gospel that I find myself in trouble in life. We cannot be fickle as followers of Christ allowing our ears to be turned away from the message of the gospel by a feel good, “I can do it” message outside of grace. A Christ-less gospel is not the gospel – Jesus Christ is the gospel. Any variation of the Truth of Grace, is a lie about God. Those who are proclaiming the positive feel good message as the gospel are unfaithful to the message of the Grace of Christ. Paul tells us in Galatians – If one of us—even if an angel from heaven were to preach something other than what we preached originally, let him be cursed. I said it once; I’ll say it again: If anyone, regardless of reputation or credentials, preaches something other than what you received originally, let him be cursed. Embrace the message of grace given to us by our Lord. The power of grace is not mere human optimism, or a feel-good, do better message. The message of the gospel is grace, and it comes straight from God by the blood of Jesus Christ. I love this verse in Luke where God reveals His level of care for each of us. God is indeed a mystery, but I don’t believe that He’s just flung His creation out there and turned it to autopilot. 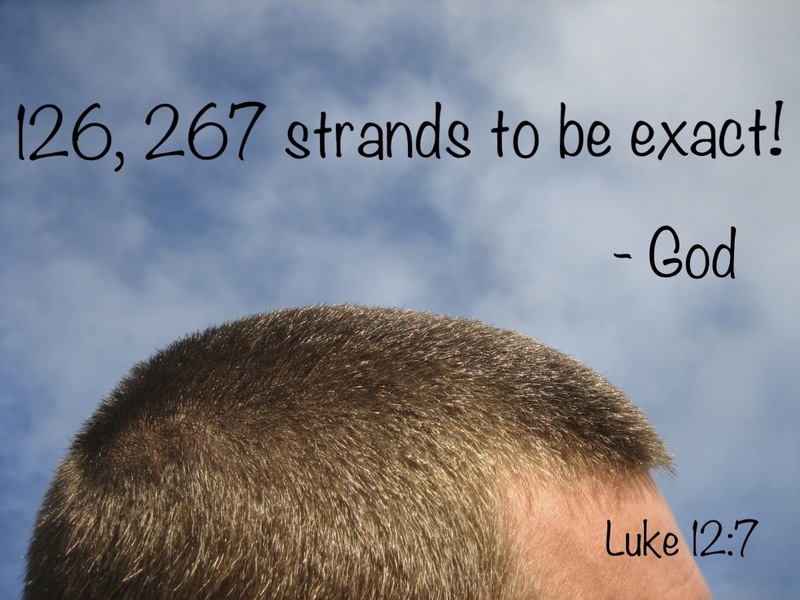 This verse clearly states that He knows us even better than we do–even the number of our hairs. Thank you God for caring for every detail of my life and your creation. REFLECTIONS ON HEAVEN: HOW CAN HEAVEN BE HEAVEN WHEN PEOPLE YOU LOVE ARE IN HELL? Are you really excited about heaven? Do you spend a lot of time thinking about what it will be like? My ears perk up every time someone mentions heaven. I’m naturally fascinated, for some reason, to know people’s thoughts about the only place Jesus refers to as “Paradise.” I’m usually disappointed, however, when people talk about heaven. My thoughts are usually something like, “Really, that’s what you think about heaven?” I don’t think I’m being self-righteous, but I do think we have not sufficiently pondered this place. We must feed on the gospel, digesting it and making it part of ourselves. That is how we grow. Money flows effortlessly to that which is its god.